KIEV, Ukraine -- Ukraine leveled fresh charges on Tuesday that Russia was sending support to pro-Russian separatists in the east, saying that five columns of heavy equipment were seen crossing onto Ukrainian territory on Monday. A woman touches a portrait of her husband in Kiev, on a banner with portraits of Ukrainian servicemen killed in the conflict with pro-Russian separatists in eastern Ukraine, November 25, 2014. The latest accusations come amid a standstill in diplomatic efforts to end the six-month conflict in the east in which the United Nations says more than 4,300 people have been killed. 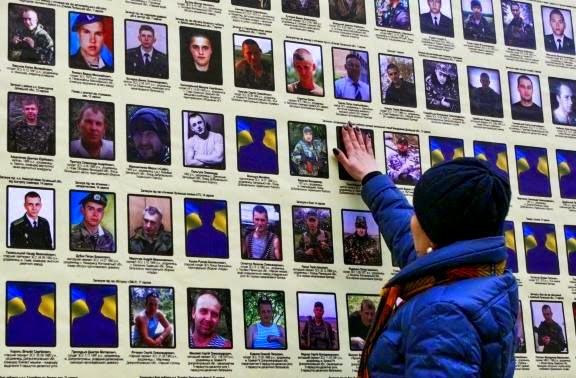 Separately, the Kiev military said one soldier was killed and five others injured in the past 24 hours as a fragile ceasefire declared on Sept. 5 continued to come under pressure. "The Russian side is continuing to provide the terrorist organizations of the Donetsk and Luhansk people's republics with heavy armaments," said a foreign ministry spokesman. Evhen Perebyinis told journalists that a total of 85 vehicles had been detected in the five columns that entered at the Izvaryne border crossing point from Russia on Monday. "Up to six of these were heavy armored transporters. The rest were vehicles and buses carrying fighters and ammunition," he said. Despite what Kiev's pro-Western leaders and Western government say is incontrovertible proof, Russia denies sending in troops to support separatist rebels trying to hive off parts of Ukraine's industrialized east and eventually join Russia. "A significant amount of the goods which are being supplied ... is fuel, ammunition and other military help." Perebyinis repeated an earlier charge that on Nov. 20, for the first time since a peace deal had been signed by Russia, Ukraine and the separatists, Ukraine had been subjected to artillery fire from the Russian Federation near the village of Kamyshine near the rebel-controlled border town of Luhansk. Describing the fire as "outright aggression" against Ukraine's territorial integrity, he called on Russia to pull out its troops and equipment from Ukrainian territory.